Stable macroeconomic indicators and growth forecasts for the next 3 years. Strategic location and potential of external markets. Beneficial cooperation with international organizations. Visa-free regime for 61 countries of the world. The lowest tax rates in the region. The easiest business management in the region. The Kyrgyz Republic is located in Central Asia and has an area of 199,000 square kilometers, or 77,540 square miles, making it 85th largest country in the world. This landlocked nation stretches 900 km east to west and 410 km north to south, and is predominantly mountainous. The Kyrgyz Republic borders Kazakhstan to the north, Uzbekistan to the south-west, Tajikistan to the south, and China to the east and south-east. The climate is continental; temperature varies from -40°С in the winter to +40°С in the summer. By its administrative and territorial system, the Kyrgyz Republic is a unitary state consisting of 7 oblasts. 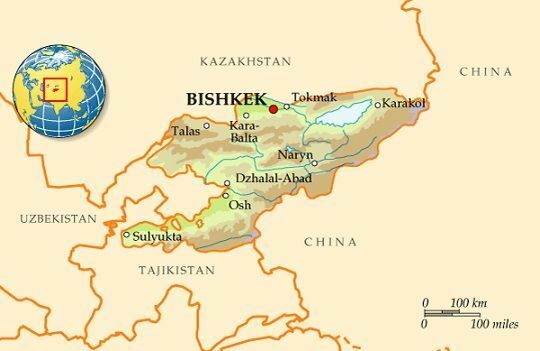 The capital is Bishkek, formerly Frunze. The Kyrgyz Republic has a permanent population of a little over 5.22 mln people, making it the least populated country in Central Asia. The population density in the Kyrgyz Republic is 26 people per square kilometer. About 90 different ethnic groups live in the Kyrgyz Republic. The Kyrgyz represent 69%, the Uzbeks 15%, and the Russians 9% of the population. The national language of the Kyrgyz Republic is Kyrgyz, while the official language is Russian. Both languages are used nearly equally and are employed for administrative purposes; however, under the legislation of the Kyrgyz Republic, the Kyrgyz version of a document is considered to be its original version. In its official relations with foreign nations (receptions, meetings, development and ratification of documents) the Kyrgyz Republic uses Kyrgyz, while in relations with the CIS countries, it uses Russian. The political system of the Kyrgyz Republic is defined in the Constitution. According to separation of powers principle set forth in the Constitution, the state authority of the Kyrgyz Republic is represented by legislative, executive, and judicial branches operating under the rule of the President. Imports (2017): $ 3.8 bln. Mobile phone users (2015): ~ 7.5 mln.